Depot Train & Hobby owner Tim Bosak in the basement of his store on West 130th Street in Cleveland. If you’ve been to the Cleveland MetroParks Zoo during the holidays in the past 10 years, you’ve probably seen the work of Tim Bosak, the owner of Depot Train & Hobby. 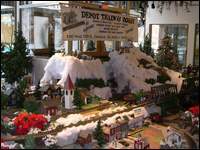 Each year for the past decade, he and his son, Chris, have built the model train display housed in the administrative building at the zoo. And, each year, Mr. Bosak takes it upon himself to add a new feature to the display, hoping to make it a more interesting and exciting for the thousands of people who visit each holiday season. The display is an extension to Mr. Bosak’s retail operation, nearly hidden on West 130th Street in the West Park neighborhood of Cleveland about a mile south of Interstate 71. But, while the zoo display is manicured and quite elaborate — this year with seven large scale model trains on roughly 350 feet of track, a waterfall, and a miniature gondola and carnival rides — his Depot Train & Hobby store might well be a celebration of, well, inventory. 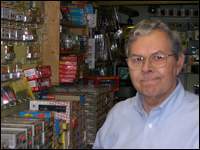 When it comes to model trains, planes and automobiles, his store has just about everything: train sets of any scale, as well as train tracks of about any variety and size, metal detailing for model cars and planes, and countless accessories. In the front room of the store, which used to be a home, there are racks and racks of model cars, planes and military vehicles. In a back room, there are model sailboats and rockets. Downstairs, though, there’s the real booty: model trains. Locomotives, including those made by Lionel and other big names in model railroading, line the walls and fill counter displays. Racks of spare train cars and accessories take up most any usable space in the basement rooms. A hallway has paint, miniature cars and tiny people to detail are model landscape. Mr. Bosak, a 58-year-old Cleveland native, explains it’s all about having the right stock at the right time. Owner Tim Bosak officially opened the store in March 1983. The store offers model cars, airplanes and military vehicles, as well as dollhouses, race tracks and hobby accessories. Depot Train & Hobby, which officially got rolling in March 1983, is as much of a story of evolution as it is about model trains. Mr. Bosak originally started a printing business, T.J. Bosak Co., at the location in 1970 and printed business cards, letterhead, brochures and pamphlets for small business clients. At one point, an employee asked if he could start selling model trains and Mr. Bosak agreed, allowing him to set up shop in the basement. Meantime, he started by selling military models and eventually added plastic model cars and planes. Although he still runs the printing business out of his first-floor office, it has become secondary to the hobby business. The hobby has developed a reputation that has spread throughout Northeast Ohio among hobbyists, he said. Partly, that’s because of his inventory. When a customer asked him to stock something, he’d get it. Each year, Depot Train & Hobby sets up the model train exhibit at the Cleveland MetroParks Zoo for its December Days program. In his 22-plus years in business, Mr. Bosak said he has considered moving the business from its current if-you-blink-you’ll-miss-it location under a Clear Channel billboard on West 130th Street. Ideally, he’d like to have the business at location with a single, larger sales floor, but he has never found the right place. But, because he owns the building he’s now in, he saves on expenses and can make it through when the economics get tough, he said. And, although his son, Chris, helps out with the holiday display at the zoo, he’s not involved in the business, Mr. Bosak said. He has one full-time employee, Loren Potts, who is a model car hobbyist and who got the job because he spent so much time in Mr. Bosak’s store, and two part-time employees. Mr. Bosak declined to reveal the store’s annual sales but said it was more than that of his printing business. He’s not the kind of guy who’d spend his retirement playing with model trains. Just as an auto mechanic’s cars are the last to get fixed and the accountant’s check book is that last to get balanced, Mr. Bosak confides he doesn’t have a model train set up in his home.